The Chamber serves as a supportive resource for Oakland’s ten Business Improvement Districts (BID) and Community Benefit Districts (CBD), which deliver tailored urban services to Oakland’s diverse neighborhoods. This group typically meets on the third Thursday of the month at the Chamber’s offices. Oakland BID Alliance communicates best practices, ideas, and resources, connects with key City and agency representatives, and advocates on behalf of its members to further the goals of BIDs in growing and maintaining Oakland’s vital commercial districts. The Downtown Oakland Association is a Community Benefit District (CBD), which is revitalizing a 19-block area in the heart of Oakland, California by providing special benefit services such as district maintenance, safety and security management, and community and cultural enrichment. The District was formed following a vote of property owners in 2009 to support a voluntary property tax to fund these additional services over the next 10 years. The Downtown Oakland Association fosters an environment where businesses thrive; art flourishes, and residents and visitors alike can enjoy all that downtown Oakland has to offer. The Fruitvale (BID) is a comprehensive neighborhood commercial revitalization program focused on the International Boulevard & Fruitvale Avenue (Zone 1) and Foothill Boulevard (Zone 2) commercial corridors. The Unity Council works daily to beautify and improve the neighborhood, and these ongoing services result in increased economic activity, a lowered perception of crime, and a greater sense of pride in the community. At the start of the program in 2001, commercial property owners voted to adopt a BID to continue revitalization efforts started under the Main Street Program, which the Unity Council had implemented since 1996. In 2006, owners renewed their commitment to supporting revitalization activities for an additional five years. The BID currently supports upwards of 350 businesses throughout the Fruitvale. The district is home to the annual Dia de los Muertos festival, which drew some 100,000 attendees in 2018. 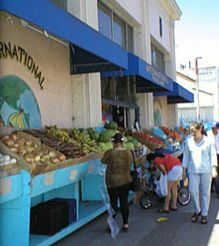 The Koreatown Northgate district is a lively and diverse business district on Telegraph Avenue between 20th and 35th streets in Oakland, CA. The Koreatown Northgate district is situated in-between Oakland's growing Uptown Arts and Entertainment District and the thriving Temescal-Telegraph business district. It also sits adjacent to the Broadway Auto Row district and the MacArthur BART station, two areas that are planning for major new residential and mixed use projects. Koreatown Northgate includes an important Korean-American commercial center, a creative arts community that participates in the monthly First Friday Art Murmur event, Alta Bates-Summit Medical Center and other healthcare services, new residential projects including the Telegraph (old Sears) Lofts and a growing variety of multi-ethnic restaurants, shops and services that are working to revitalize the neighborhood. The Laurel District Association (LDA) is a 501(c)(3) property-based Business Improvement District (PBID) established to revitalize the commercial corridor. The property owners on MacArthur Blvd from 35th Ave to High Street voted to pay an additional assessment tax based on the square footage, useage, and frontage of the lot size. The assessments are managed by the Board of Directors according to the District Management Plan passed by City Council December of 2005. The LDA is organized into committees that work to revitalize the Laurel District and increase the quality of public improvements and educational, cultural, artistic, charitable and social services within the Laurel District and the surrounding neighborhood. 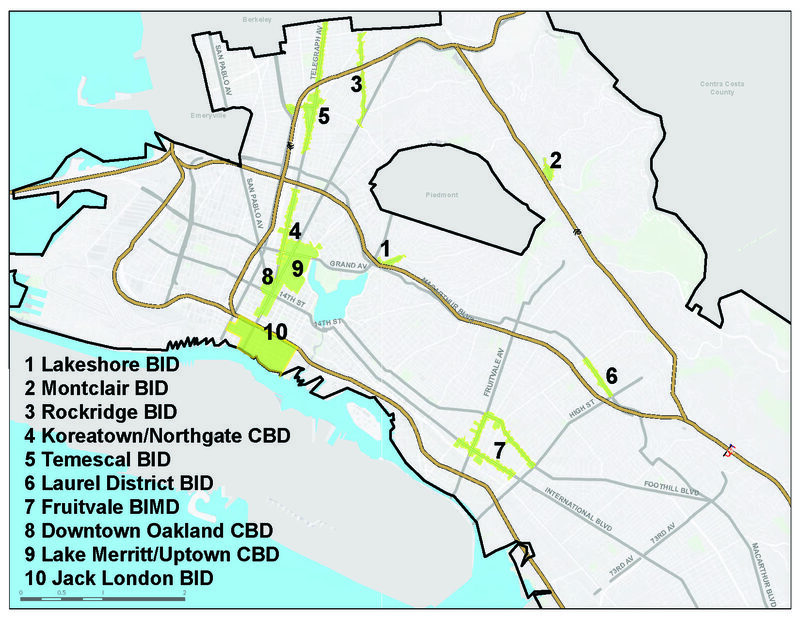 The Lakeshore Avenue Business Improvement District was the first BID in the City of Oakland. 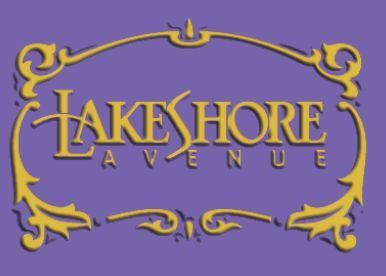 In 1998 the property owners on Lakeshore and later Lake Park Avenues, joined together to form this non-profit by voting to assess themselves additional fees, based on a combination of frontage and square footage of their properties. The BID uses the assessments to fund: daily sidewalk and gutter cleaning, monthly steam cleaning, gardening in the tree wells and some larger plots, daily private security, promotions and events (4 times a year), and staffing/advocacy for the merchants and property owners in conjunction with neighborhood organizations. The Montclair Village Association (MVA) is a Business Improvement District made up of approximately 210 retail and service businesses located in Montclair Village. The MVA was previously known as the Montclair Business Association (MBA) for over 50 years. In 2001 the businesses located in Montclair Village voted to become a Business Improvement District by agreeing to pay an additional assessment each year to the City of Oakland based on their gross revenue. In 2010, the Association created a new category of associate membership, to permit businesses located adjacent to the Village to join and enjoy the same benefits of Association membership. The assessments paid by MVA members and Associate members are used to pay for revitalization efforts in the neighborhood commercial district, covering maintenance, beautification, promotions and security issues not supplied by City resources. The Rockridge District is a commercial and residential neighborhood in North Oakland. Many of Oakland’s best restaurants, eateries, and wine bars are found along College Ave, the District’s main commercial thoroughfare running from 51st and Broadway north to Alcatraz. The Rockridge District Association is dedicated to enhancing Rockridge through public works as well as promotional and beautification initiatives to make a strong, vibrant, diverse business center. In August 2004, commercial and residential property owners along Telegraph Avenue and adjoining areas voted to form a special benefits assessment district along Telegraph Avenue from 40th to 66th Street (Berkeley border), including small portions of Shattuck Avenue, 51st Street, Claremont Avenue, and also Children's Hospital. This is known as the Temescal/Telegraph Business Improvement District ('Temescal Telegraph BID'). The BID's mission is to make the Temescal Telegraph commercial corridor more pedestrian-friendly for its residents, build upon the sense of community, and attract new shoppers. The Lake Merritt/ Uptown Association is Community Benefit District (CBD) which serves to revitalize a 37-block area in the heart of Oakland, California. The CBD provides special benefit services such as district maintenance, safety and security management, as well as cultural and community enrichment. The District was formed in 2009 by property owners who supported a voluntary property tax by a margin of almost 8 to 1 supporting a 10-year property tax designed to fund the additional services to the community over the next 10 years. The Downtown Oakland Association and the Lake Merritt/Uptown District Association meet and function jointly to improve the quality of life in their respective communities and advocate on behalf of the area property owners, business owners, and residents.